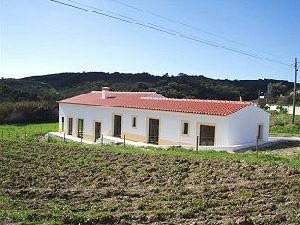 A brand new villa in a village location within the natural park. 15 minutes drive of six beaches on the west coast including one further down the road from house. Also 20 mins drive from south coast beaches and the fascinating town of Lagos. Local shops and many good restaurants in Aljezur (10 minutes away) genuine Portuguese food at Portuguese prices. Bedroom 1 with double bed and ensuite bathroom. Bedroom 2 with twin beds and ensuite shower room. Bedroom 3 with twin beds and ensuite shower room. Cloak room - toilet and hand basin - clothes washing machine. Kitchen:	Oven, hob, fridge/freezer, dishwasher, microwave, electric kettle, toaster and blender. Utility Room:	Cloak room at entrance with clothes washing machine, ironing board and iron. Living Rooms:	Open plan living area divided by free standing double sided fireplace. lounge area with sofabed (double) - (seats 4), sofa - (seats 3) and armchair. open plan dining room - seats 8. modern fitted kitchen with breakfast bar and granite worktops. Other:	Large covered patio with views over open countryside at the rear of the house. Cloak room. Washing machine, ironing board and iron. Kitchen:	Oven, hob, fridge/freezer, dishwasher, microwave, electric kettle, toaster and blender. Breakfast bar and granite worktops. Living Rooms with fireplace. Lounge area with sofabed (double) - (seats 4), sofa - (seats 3) and armchair. Dining room - seats 8. Other: Large covered patio with views. Linen and towels and cleaning provided - changed weekly.